This is a Quality Cult Cinema exclusive release of an ultra rare short movie. You will not find this film any other place on the interweb (I've searched). It was once released on VHS as the third film on a tape labeled Stephen King's Nightshift Collection, even though Killing Time was based on a story by Dennis Etchison, not King. 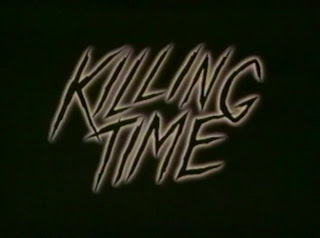 The first two films on the tape, were quite bad no-budget productions of a couple of Stephen King stories, but as Killing Time apparently has nothing to do with King at all, it was only included on very few tapes, before someone decided to remove it from further releases of the tape that was also somewhat obscure in its own right. That's why the hard-coded Norwegian subtitles are there, as it's never been released on DVD, and I've been unable to track down any other version than this. I've even tried to contact Dennis Etchison himself, as he also plays a short cameo in the film, and hopefully has some more information about it, but it turns out he's turned into somewhat of a recluse and is "a bit wary of the Internet" according to his editor. And all the mystery surrounding the film is very strange, considering the top notch quality of film making throughout the mere 26 minutes it lasts. There's talent practically bursting out of every pore, from the story it was based upon, to the direction, cinematography, soundtrack, eerie atmosphere and great comic book artwork which intertwines the scenes all the way to the low-key ending which somehow still packs a punch. The acting is also ace, featuring a performance by Eric Stoltz. To think that he did this tiny film, after he'd starred in Pulp Fiction, tells me it must have been a favor to a friend or something. If I was to compare Killing Time to anything, it would have to be cultastic mega-hit They Live, and I've always found it strange that Killing Time was never expanded into a full feature, as there's tons of material there to expand upon. If you are in any way connected to the making of this film and do not wish it to be here, please let me know, and I'll remove it pronto. Thanks for sharing. It wasn't easy to find it out. No problem! I'm so glad more people are discovering this magnificent short film.